There's no gravy our cheese curds to be found in this dessert poutine, and Canadians aren't having it. Hold onto your hats, Canada. Tim Hortons, the Dunkin’ Donuts of the Great White North, has announced a new treat blending two of Canada’s most prized food stuffs: poutine and Timbits. The dessert, debuted at this year’s Canadian National Exhibition, is a cup full of Timbits (doughnut holes, for you non Canucks) topped with whipped cream, sprinkles, and other things you’d find behind the sneeze guard at your favorite yogurt shop. 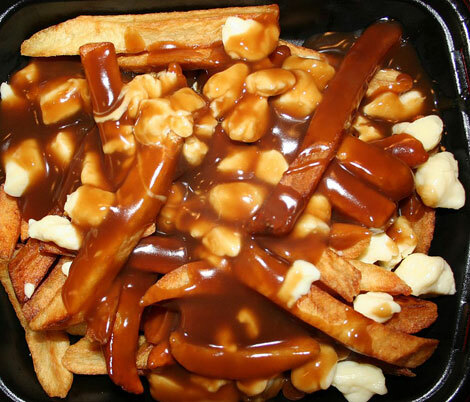 For the completely uninitiated American, poutine is a Canadian dish featuring french fries and cheese curds drenched in gravy; it is one of the G.O.A.T. drunk meals. Because it’s such a simple dish, though, poutine lends itself to variations. Ramen poutine! Vegetable poutine! Poutine burger! Most of these things at least stick to the french fries, cheese curd, and gravy formula. The Tim Hortons Timbits poutine, on the other hand, is like if Dunkin’ Donuts started advertising soft-serve ice cream, but instead gave you a cone filled with three Munchkins topped with Reddi-Whip. Tim Hortons Timbits poutine is not poutine at all, and some Canadians are not happy about it.